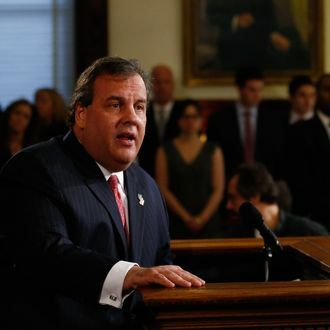 New Jersey Governor Chris Christie’s apology and/or explanation and/or buck-passing press conference about the George Washington Bridge traffic scandal lasted nearly two hours on Thursday. During that time, as Christie gave some prepared remarks and then answered questions from reporters, he used the passive voice so much that one began to wonder if anybody had done anything at all. Perhaps this whole scandal just sort of … happened. So to help clarify Christie’s statements, at least in his prepared remarks, we offer this annotated version of the relevant sections from the Washington Post’s transcript. The overtly, unnecessarily passive or wordy statements are in bold, with more concise, active versions in italics below. I am embarrassed and humiliated by the conduct of some of the people on my team. The conduct of some people on my team embarrassed and humiliated me. There’s no doubt in my mind that the conduct that they exhibited is completely unacceptable and showed a lack of respect for the appropriate role of government and for the people that were trusted to serve. The first is I believe that all of the people who were affected by this conduct deserve this apology and that’s why I’m giving it to them. I also need to apologize to them for my failure as the governor of this state to understand the true nature of this problem sooner than I did. But I believe I have an understanding now of the true nature of the problem and I’ve taken the following action as a result. People deserve an apology. I failed to understand the true nature of this problem quickly enough. But I now understand it and I’ve taken the following action. I put to all of them one simple challenge: If there is any information that you know about the decision to close these lanes in Fort Lee, you have one hour to tell either my chief of staff, Kevin O’Dowd, or my chief counsel, Charlie McKenna. I told my staff if you know anything, you have to tell my chief of staff or my chief counsel. And I told them that in an hour I was going to go out in a press conference. And if no one gave me other information to the contrary that I was going to say that no one on my staff was involved in this matter. I said if no one gave me information to the contrary I would say that none of my staff was involved. Over the course of the next hour, Kevin and Charlie interviewed each member of my senior staff, came back and reported to me that they all reported that there was no information other than what we already knew that had been testified to by Senator Baroni regarding this incident. Kevin and Charlie interviewed each member of my senior staff, and told me that none of them knew anything more. I then questioned Kevin O’Dowd and Charlie McKenna directly, since they are the only two who report directly to me, and they assured me that they had no information that would change my ability to be able to say that no one, in response in Angie’s question, on my staff was involved in this matter. I then questioned Kevin O’Dowd and Charlie McKenna myself, since they report directly to me, and they assured me they knew nothing that would implicate anyone on my staff in this matter. That was obviously a lie. And the emails that I saw for the first time yesterday morning, when they broken in I believe the Bergen Record story, proved that that was a lie. … And as a result, I’ve terminated Bridget’s employment immediately this morning. They lied. So I fired Bridget. Secondly, I have and will continue to, started yesterday, to once again now have personal one-on-one discussions myself with the remaining members of my senior staff to determine if there’s any other information that I do not know and need to know in order to take appropriate action. I will speak with the rest of my staff to uncover any more new information. I’m not completed with those interviews yet, but when I am, if there is additional information that needs to be disclosed, I will do so. If there’s additional actions that need to be taken with my senior staff, I will do so. I have not finished those interviews yet, but if they yield any pertinent information I will share it. I will also take any additional necessary action regarding my staff. I will tell you, though, it’s been written a lot over the last couple of days about what a tight-knit staff I have and how closely everyone works together, and that is true. I do have a close-knit staff. And ever since the time I was U.S. attorney, I’ve engendered the sense and feeling among the people closest to me that we’re a family … I am heartbroken that someone who I permitted to be in that circle of trust for the last five years betrayed my trust. I tell them to be honest and open like family, and it disappoints me that they were not. I would never have come out here four or five weeks ago and made a joke about these lane closures if I had ever had an inkling that anyone on my staff would have been so stupid but to be involved and then so deceitful as to just — just to not disclose the information of their involvement to me when directly asked by their superior. And those questions were not asked, by the way, just once; they were asked repeatedly. Had I known any dummies on my staff were involved, I never would have joked about this. And I asked them repeatedly about it. We fell short of the expectations that we’ve created over the last four years for the type of excellence in government that they should expect from this office. We should be more excellent. And so when I find those imperfections, those mistakes, those lies, my obligation as the chief executive of this state is to act. And as to Bridget Kelly, I’ve acted today. I must act in response to inappropriate behavior. Secondly, I was disturbed by the tone and behavior and attitude of callous indifference that was displayed in the emails by my former campaign manager, Bill Stepien. And reading that, it made me lose my confidence in Bill’s judgment. The tone of Bill Stepien’s e-mails disturbed me and impaired my confidence in his judgement. Because of that I’ve instructed him to remove himself from positions of authority in state politics. That has also been communicated to Mr. Stepien last night. There’s no doubt that Bill has been one of my closest advisers over the last five years. And so for that too I am sad today to have to take this action. But I also know that I have a job to do. And it’s the job that I’ve asked the people of New Jersey to entrust me with. And I can never allow personal feelings or long-standing relationships to get in the way of doing my job the way it’s appropriate to do it. I told Stepian as much last night. Bill has been one of my closest advisers over the last five years. But I still have to do my job. Ultimately I am responsible for what happens under my watch — the good and the bad. And when mistakes are made, then I have to own up to them and take the action that I believe is necessary in order to remediate them. As I mentioned to you earlier, I spent all day yesterday digging into talking to folks and getting to the bottom of things. I know there was much discussion yesterday about what was I doing. I am ultimately responsible for my team’s mistakes, and I have tried to understand the scope of them. Well, let me tell you, everybody, I was blindsided yesterday morning. I was done with my workout yesterday morning and got a call from my communications director at about 8:50, 8:55, informing me of this story that had just broken on the Bergen Record website. That was the first time I knew about this. That was the first time I had seen any of the documents that were revealed yesterday. This surprised me. I work out. The Bergen Record broke the story. And so before I came out and spoke to all of you, I wanted to do the best I could to try to get to the bottom on some of this so that when I came out I could answer questions as best I can and take appropriate action if action was necessary. I tried to learn as much as I could before I had to answer questions and take action. There was no doubt from reading those emails yesterday, in my mind, that action was necessary. And then I wanted to make sure that I spoke to those people who advise me to make sure if there was any other information they were aware of, that I had it before I acted. I never doubted I must take action, but I wanted all the information first. And as I said, if there’s more information that I uncover, I’ll act accordingly in terms of releasing it to the public and taking whatever action may be necessary, if any is, for any other issues. And also, we’ll react to any information that’s incoming from anyplace else, given that there’s an OIG investigation and a legislative investigation. If I learn anything new I’ll reveal it and take action. Later today I’m going to be going to Fort Lee, asked to meet with the mayor to apologize to him personally, face to face, and also to apologize to the people of Fort Lee in their town. I will go to Fort Lee and personally apologize to the mayor and the citizens there. This is not the tone that I’ve set over the last four years in this building. It’s not the environment I’ve worked so hard to achieve. We saw just a few months ago, and I’ve seen over the course of the last four years, Republicans and Democrats working together, not without argument – government’s never without argument – but ultimately coming to resolution on so many different issues in a bipartisan way and running a campaign that was in fact a bipartisan campaign. I don’t want to run state government with this kind of partisan animosity. And so I am extraordinarily disappointed by this, but this is the exception, it is not the rule, of what’s happened over the last four years in this administration. I’ve considered it over the last four years to be my job to be the governor of every New Jerseyan – Republican, Democrat, independent or unaffiliated – and I’ve worked with elected officials on both sides of the aisle, ones that I agree with and ones that I disagree with. The political overtones that were exhibited in those documents released yesterday and the conduct by those people is not acceptable. I consider it my job to represent everybody in the state, which, as those documents reveal, I and my team did not do. But people, I think, all across this state understand that human beings are not perfect and mistakes are made. Everybody makes mistakes. Please cut me a break. I had no knowledge or involvement in this issue, in its planning or it execution, and I am stunned by the abject stupidity that was shown here. Regardless of what the facts ultimately uncover, this was handled in a callous and indifferent way, and it is not the way this administration has conducted itself over the last four years and not the way it will conduct itself over the next four. Again, I didn’t know about this, and it’s not how I want my administration to behave. I will do everything within my power to assure the people of New Jersey that. And I thank them for their willingness to consider my apology on behalf of this government. In the end, I have 65,000 people working for me every day. And I cannot know what each one of them is doing at every minute. But that doesn’t matter; I’m ultimately responsible for what they do. And that’s why I took this action. Please accept my apology on behalf of my many staff members.